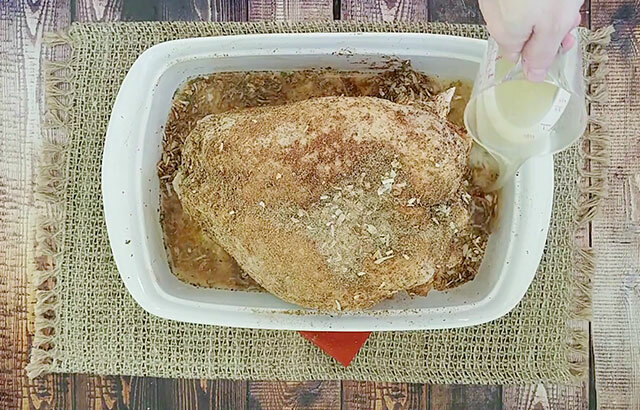 Oven Roasted Turkey Breast recipe with onion soup mix, garlic, celery salt, and thyme! 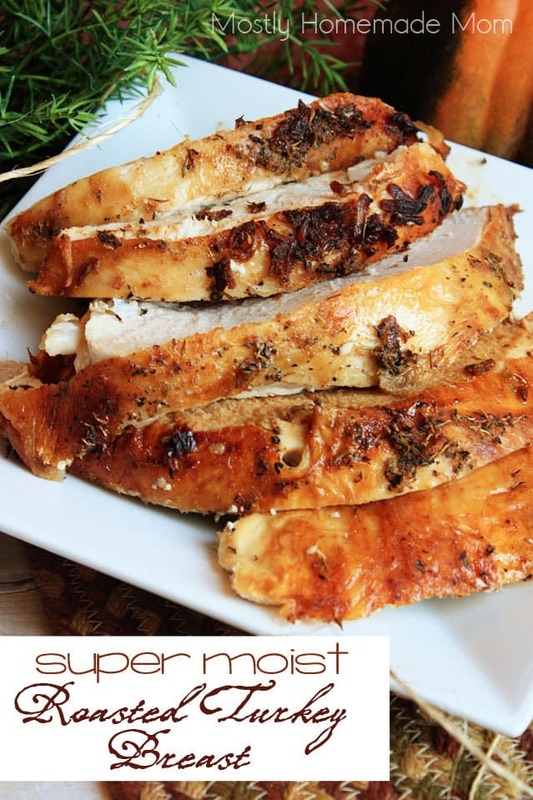 This is a wonderful roasted turkey breast recipe for Thanksgiving or Christmas dinner! 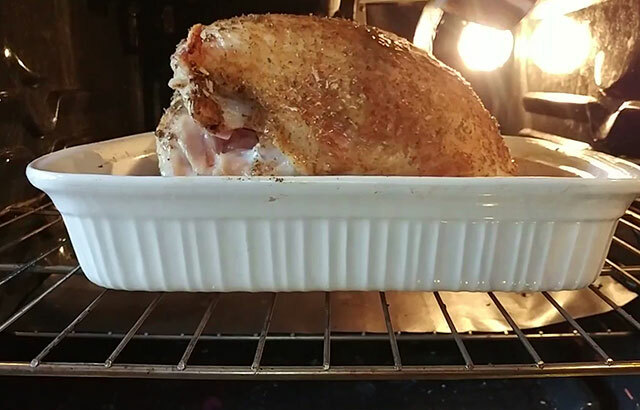 Cooking your own oven roasted turkey breast can sometimes be a little daunting! After all, for most families the only time we ever eat roast turkey breast is on Thanksgiving and maybe Christmas. Not to worry, this recipe is super easy and the flavor on the skin of this turkey is fantastic! How long do you cook a turkey breast per pound? Roast bone in turkey breast in the oven at 350 degrees for 20 minutes per pound. 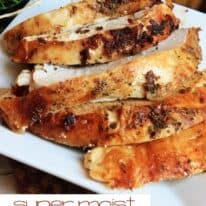 How do you cook a moist turkey breast? By adding more chicken broth throughout the cooking process and basting often – every 30 – 45 minutes during bake time. In a small bowl, stir together the dry onion soup mix, garlic, thyme, basil, and celery salt. 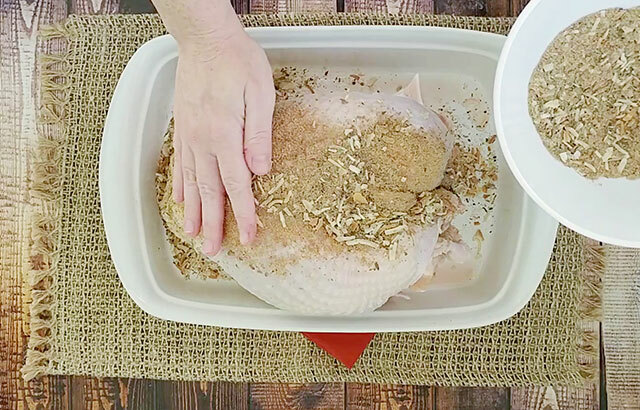 Evenly rub dry mixture onto turkey breast in a shallow baking dish. Pour chicken broth into the bottom of the baking dish. Bake turkey at 350 degrees for 20 minutes per pound. Add 2 cups more of the chicken broth, 1 cup at a time, every 45 minutes during the bake time. After that, baste the turkey every 30 minutes until the turkey is done. Remove from the oven and allow the turkey to rest, covered with foil, until ready to serve. Ladle pan juices over turkey as needed. 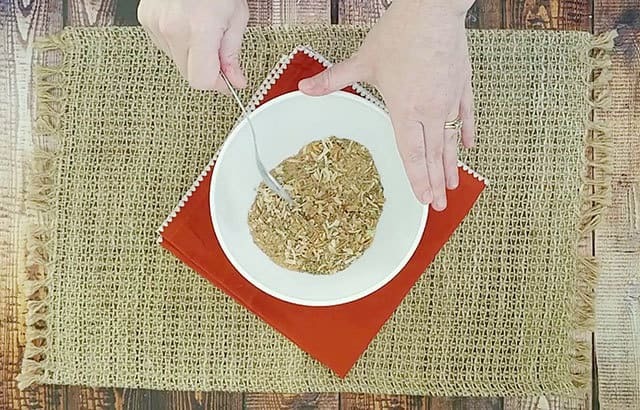 Why use a turkey breast? Why not just use a whole turkey? Whole turkeys take up way more space in the oven, require a much larger roasting pan, and take double the time (at least) to cook than a turkey breast. 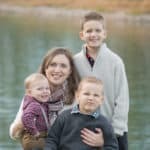 I have a family of 5 and a 8-10 lb turkey breast easily feeds us for 2 meals! 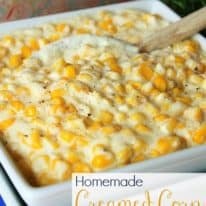 Crockpot Stuffing – no need to free up oven space for this one! Maple Walnut Sweet Potato Skins – roast the sweet potatoes in the oven before the turkey goes in, then finish the recipe as the turkey is cooling and resting. Cinnamon Sugar Yeast Rolls – make these up the day before and just warm them in the oven or microwave just before serving! 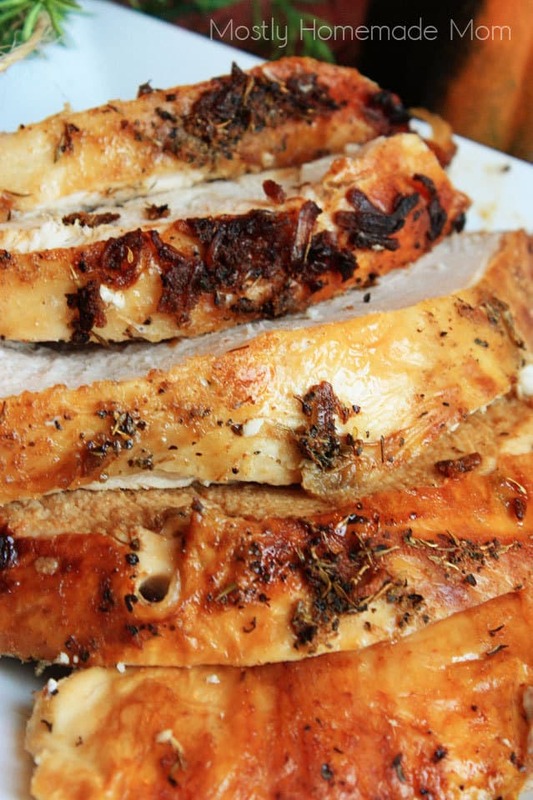 Did you like this recipe for Oven Roasted Turkey Breast? Leave a rating and a comment below this post! Oven roasted turkey breast recipe seasoned with garlic, celery salt, thyme, basil and onion soup mix. In a small bowl, stir together the onion soup mix, garlic powder, celery salt, thyme, and basil. Place thawed turkey breast in a 9 x 13 inch baking dish. Rub dry seasoning mixture onto surface of turkey evenly. Pour 1 cup of chicken broth into the bottom of the baking dish. 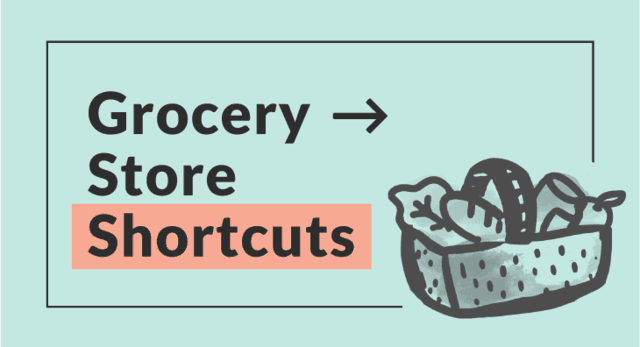 Bake at 350 degrees for anywhere from 1 1/2 hours to 3 hours (or more) depending on the size of your turkey - consult the instructions on your turkey for specifics, but usually 15 - 20 minutes per pound. About 45 minutes into cooking, pour another cup of chicken broth over the top of the turkey. Repeat again after another 45 minutes of cooking, using the remaining cup of chicken broth. Baste the turkey every 45 minutes thereafter, until turkey is done and registers 165 degrees on a meat thermometer place deep into the breast meat. Remove from the oven and cover the turkey with foil. Allow it to rest for 15 minutes before slicing. I like to slice the turkey and then allow the slices to sit in the bottom of the pan soaking up all the juices until everyone's ready to eat. This looks absolutely scrumptious. 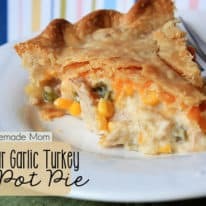 I make a full bird for Thanksgiving, but I love turkey year around and often just want to make the breast…I've found my recipe! Me too, Tonia! My favorite holiday! 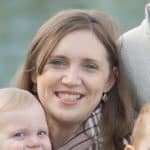 Michelle, my husband had just said that he wouldn't mind if I made it any time of the year like this! I hope you like it, Bev! Best turkey recipe. 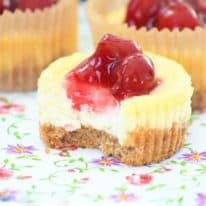 Easy, moist and so flavorful! My brother used to smoke turkey breast’s. One year he couldn’t do it and I cooked this recipe. He says it’s way better than his smoked turkeys. I am going to give it a 3 for tenderness and appearance. As far as taste goes. The turkey had way too much of an onion taste. Maybe next time only 1 pack. The breast was about 5 1/2 lb so maybe that was too much seasoning. Then it was a pain to set the timer add broth, set the timer baste. I am more of a put it in the oven and let it cook.